The current controversy over the proposed Palomar utility corridor (that would slice across the Clackamas River country, south of Mount Hood) is an uncanny reminder of the 1950s disaster that brought the Bonneville Power Administration (BPA) transmission lines to Lolo Pass, north of Mount Hood. In both cases, the result is a permanent, linear clearcut running up and down mountainsides, with almost no regard for visual or environmental impact. The BPA lines came with the completion of the John Day and The Dalles dams, along the lower Columbia River. As if drowning the incomparable Celilo Falls weren’t enough, the transmission lines crested the Cascades at Lolo Pass, at the time one of the more remote and spectacular corners of the Mount Hood backcountry. In the 1950s, American society was still in the early years of sprawling hydroelectric projects and rows of transmission towers marching toward the horizon. At the time, these images equaled progress, and nothing more. But the BPA lines over Lolo Pass marked a particularly senseless disregard for the landscape, needlessly ruining mountain valleys, blocking Mount Hood vistas, and creating a permanent nuisance with the permanent clearcut that is maintained along the corridor. The transmission lines also brought a new road to Lolo Pass, along with a devastating logging program that nearly cleared the Clear Fork and Elk Creek valleys, along the corridor. The permanent clear cut below the transmission lines was maintained for decades with chemical herbicides, though the BPA has more recently bowed to pressure to maintain their swath of destruction with mechanical methods. Over the years, the lines have multiplied, and today, the Lolo Pass swath encompasses four large transmission lines in a quarter-mile wide swath. The maze of “closed” dirt maintenance roads below the lines are a perennial draw for target shooters, off-highway vehicles and illegal dumpers. These activities, in turn, have helped turn the linear clear cut into a conduit of invasive species, brining Scotch broom and Himalayan blackberry deep into the Cascades. The lessons from the Lolo Pass disaster are many, but above all, we’ve learned that a single utility corridor will almost surely grow over time, as utility planners make the case that future lines ought to follow these existing paths of least resistance. We’ve also learned that the visual and environmental blight that the corridors create is insidious, causing forest managers to discount the value of adjacent, intact forests as somehow tainted — as less worthy of protection or even recreation use. This will surely be the case if the Palomar corridor is approved. But the story of Lolo Pass is not complete, and the final chapter has yet to be written. Why? Because after just 50 years, the BPA lines are already approaching their design life, and will eventually need to be replaced. Under the logic that led to the expansion of this corridor to encompass four parallel transmission lines, it would be easy to assume that the towers and lines will simply be replaced in place, within the existing corridor. But it will be equally possible to imagine something better for Lolo Pass — relocating the corridor and restoring the pass, and perhaps finding a better, more efficient, less destructive way to transport our energy. That’s the dream and vision for many who hold the former beauty of Lolo Pass in their memories, and can imaging restoring this corner of the mountain to its fomer splendor. But it’s also a reminder not to repeat the Lolo Pass mistake at Palomar, setting yet another legacy of perpetual, linear destruction in motion. The Gnarl Fire of 2008 shocked Portlanders by racing across the east slopes of Mount Hood, and nearly destroying the historic buildings at Cloud Cap and Tilly Jane. But as an east side fire, the Gnarl burn was relatively small, and part of what has become an annual ritual for rural communities of fighting intense blazes along the east slope of the Cascades. The cause for the intensity of these fires is well-known and well-documented. We know that a century of fire suppression, promotion of even-aged stands of second growth in logged areas and a changing climate are forces conspiring to burn the east side forests on a scale not seen in recent decades. But not all of the east side fires are catastrophic, even with the fuel build-up from our history of fire suppression. The 2006 fire at Bluegrass Ridge was a glimpse into what was once a routine occurrence along the east side of the Cascades. The Bluegrass Fire began as a lightning strike in the dry season, and soon spread along the east face of the ridge in a mosaic pattern: some parts of the forest were completely killed, while others were a mix, where pockets of forest survived among the burned trees. Most significantly, the larger, fire-resistant species like western larch and ponderosa pine often survive fires in these mosaic areas, and this was the case in the Bluegrass Fire. We will know in a year or two whether the extensive larch population in the Gnarl Fire area were similarly resistant. The survival of these big trees is the key to the natural ecosystem that defines east side forests. Forest ecologists are now calling these east side regimes “fire forests”, as a counterpoint to the west side rain forests, where abundant rainfall is the operative element in defining the forests. The “fire forest” name is apt, since we now know that a number of tree species in this dry forest system depend on fire for natural succession that creates mature forests. In the Mount Hood area, these east side trees are Douglas fir, western larch and ponderosa pine. All three have thick, fire-resistant bark that helps them survive moderate fires, and benefit from periodic clearing of undergrowth that competes for moisture and soil nutrients. Fires, in turn, release nutrients for the big trees, further enhancing the growth of fire-resistant species. The question for the east side forest is not whether they will continue to burn — they have evolved with fire, after all — but rather, how we will learn to live with the fires. We now know that we cannot simply extinguish them. A century of fire suppression has created mammoth fires that we simply cannot control. We also know that we cannot prevent forest fires from starting, since the large majority begin from lighting strikes. And we know that many more catastrophic burns will occur before the east side forests return to a more sustainable condition that mimics the natural ecosystem that once thrived. Most ominous is the recent discovery — from tree-ring research — that the Western states are coming off an unusually wet century, and that the decades ahead are likely to carry more drought, not less. So it is imperative to help the east side forests stabilize before conditions make that proposition still more difficult. A first step is continuing to thin tree plantations on logged lands to help prevent still more crowded, bug-infested forests like those that are currently driving the fire epidemic. The second step is more difficult: letting fires burn. This policy will be most difficult in the many areas where rural development has encroached on forest boundaries, but it is a necessary step. Both of these steps will require a new mindset about fire, not the least of which will be a public education shift away from Smokey Bear and fire suppression and toward a modern understanding of fire. But a third step is most difficult of all: setting fires in prescribed locations to help restore forest balance. While the rash of east side fires in recent years has made this part of restoring forest balance less urgent, it will still be necessary — and controversial. Federal agencies have already begun employing this tool, but in cases where a controlled burn becomes a wildfire, the public is not prepared to understand why that risk is necessary — and perfectly natural. Still more public outreach and education will be needed. The good news is that the scientists are winning this debate, and even the Forest Service has gradually begun to embrace fire ecology as part of their management philosophy. The Park Service is much further long, having successfully weathered the early criticism of their prescient decision to let the huge Yellowstone fires of the mid-1980s burn. The remarkable resilience and recovery of Yellowstone in the intervening years has not only been vindication for that bold decision, but also an invaluable lesson to land agencies across the west who are responsible for managing “fire forests”. The time to embrace fires in our forests has arrived. The first part of this article focused on the Forest Service failures that allowed the massive Boundary clear cut to happen on Mount Hood’s northwest shoulder. Now, a look at more of the fallout from the massive clear cut, and opportunities for restoring the area in the future. First, some numbers. Using a conservative estimate of 100 trees per acre, the 800 acre Boundary complex contained at least 80,000 mature trees, mostly noble fir. Using the Forest Service’s Center for Urban Forest Research models (2002), a conservative estimate for storm water interception of each tree is at least 1,100 gallons per year, or some 88 million gallons of runoff from the Boundary clear cut area, alone. How much additional runoff is that? Enough to nearly fill the 33-story KOIN tower in downtown Portland. Without the forest canopy, the bulk of the rain that falls upon these mountain slopes now runs off, eroding the thin soils, carrying mud and sediments to nearby streams and resulting spikes in stream flows that damage riparian areas and fish habitat. This effect is repeated, of course, across the thousands of clear cuts in the Mount Hood National Forest. For the Boundary clear cut, the runoff impact is on the heavily logged West Fork Hood River drainage, which is already struggling to recover from the first wave of logging at the turn of the 20th Century (see “Just 75 years” article). Like other clear cuts, the Boundary cut also triggered edge effects on the uncut forests bordering the timber sale. Because the Boundary clear cut is high elevation, and nearly crests Vista Ridge, these were impacts that timber planners surely could have expected. Yet the timber sale spread close enough to the historic Vista Ridge trail that blowdown triggered by the cut still fall across the trail with regulatory, and unnecessarily. Sadly, this was preventable. 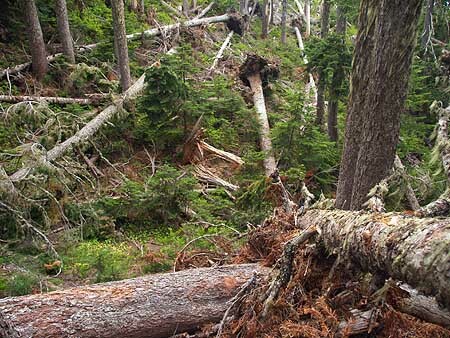 These trees along the Vista Ridge Trail are victims of the Boundary clear cut, having been exposed to high winds by the removal of adjacent forests. What to do next? For the cut forests of the Boundary complex, the main treatments are road decommissioning and thinning operations in 15-20 years, when the plantations of young trees are likely to become a crowded monoculture. But from a broader perspective, what about restoring recreation to the area? The Mount Hood National Park campaign calls for converting several roads in the area to single-track bike and horse trails, and adding a campground in proximity to these new trails, and the Vista Ridge trailhead. There are also opportunities to connect the Vista Ridge trail to the Mazama Trailhead, across Ladd Creek. This new route would provide much-needed loop options that would disperse the heavy hiking traffic that Mount Hood experiences in summer, plus access to the little-known lakes and rocky viewpoints that lie just beyond the destruction zone of the Boundary clear cut. The key in making this transition is restoration through recreation — bringing visitors back to the area with the express purpose of fostering a public sense of stewardship needed to ensure that a Boundary clear cut never happens again.